Jacqui Smith, the Home Secretary, was forced to apologise today after the Government admitted that its figures on the number of migrant workers in Britain were wrong by more than a third. Ms Smith said it was “bad” that the statistics originally issued for the increase in foreign nationals since 1997 had been incorrect. Her remarks came after Peter Hain, the Work and Pensions Secretary, said that the increase in foreign nationals working in the UK since 1997 was 1.1 million, 300,000 more than previously stated. The confusion deepened further tonight after a third figure emerged suggesting that 1.5 million additional foreign-born workers had entered the UK in the last decade. The Government said that the figure included 400,000 British citizens born overseas. Ms Smith said: “Of course it is bad that these figures are wrong and ministers have apologised for that, I am sorry about that. But the important point is that actually there are 2.7 million more jobs in this country than there were in 1997. David Cameron will enter the political minefield of immigration today with a call for measures to meet the challenge of rapid population growth. In his first major speech on immigration and population, the Conservative leader will attack Gordon Brown for failing to tackle the root causes of Britain’s growing demographic problems, ensuring that it will become an issue for the next election. In a speech to the Policy Exchange think-tank, Mr Cameron will call for a “grown-up conversation” about population growth. Britain’s population is set to rise by nine million over the next 20 years, because of higher life expectancy and higher net immigration, along with a big rise in the formation of new households as more and more people live alone. There is a small, but growing number of Chinese novelists who use Foreign languages to write books. 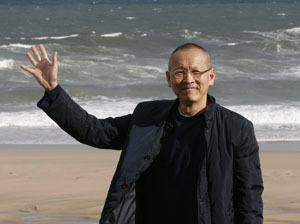 For example, Ha Jin has published several critical acclaimed books in English, and recently two stories from Li Yiyun’s award-winning debute, A Thousand Years of Good Prayers, has been adapted into two movies by the Chinese-American director Wayne Wang. In the UK, Guo Xiaolu’s A Concise Chinese-English Dictionary for Lovers entered this year’s Orange Broadband Prize shortlist. TOKYO (AFP) — Chinese author Shan Sa’s identity has circumnavigated the world — she lives in France, is impassioned by Japan and is now turning her attention to her homeland. The novelist, whose real name is Yan Nini, has lived in Paris for more than half her life as part of a literary diaspora that stretched its wings as China began opening up to the world three decades ago. Like many other emigre authors who write in a foreign tongue — Dai Sijie in French or Ha Jin in English — Shan Sa has written mostly in French, apart from her first book of poems when she was 10 years old. Her books include “The Girl Who Played Go,” which won an award in France and has been translated into English but remains unpublished in Chinese. Her most recent book is “Shall We Meet in Tokyo at Four in the Morning?” in which she explores her own roots. It has been published first not in French but in Japanese in a collaboration with Richard Collasse, head of French fashion house Chanel in Tokyo. GUANGZHOU, Oct. 12 (Xinhua) — A senior UN official said Friday the Chinese economy enjoying sustained rapid growth was not a threat, as it has been demonstrating a positive effect in the global economy. In his keynote speech titled “Sustaining China’s Development in New Global Environment”, the economist-turned-official said China has had a stabilizing effect in the global economic system when the U.S. subprime problems unleashed uncertainties. Chinese cars took a step closer to Europe this week with the granting of European Type Approval to the Landwind X-Pedition, writes Andrew English. This 4×4 copy of a 20-year-old Vauxhall Frontera is the first Chinese car to get full approval in Europe. It will face the New Car Assessment Programme (NCAP) crash test early in November, with the first right-hand-drive sales in the UK slated for next September. LONDON (AFP) — The record price for a Chinese contemporary artwork was smashed in London on Friday, Sotheby’s auction house said, for a painting based on the 1989 Tiananmen Square protests in Beijing. Yue Minjun’s “Execution” fetched 2,932,500 pounds (5,964,700 dollars, 4,210,300 euros) after two telephone bidders battled it out. The pre-sale estimate was between 1.5 and two million pounds. The previous highest price paid at auction for a Chinese avant-garde artist was set in June for Yue’s 1997 work “The Pope” for 2.15 million pounds. The Scotsman reports that Edinburgh’s Stevenson College has given certificates to its seventh group of Chinese teachers. The course is specially tailored for the development of Chinese teachers. In parternship with Cambridge University, Stevenson College is the only Scottish centre offering English lessons to the teachers. Besides the language, the class also visited schools across Edinburgh to better understand the teaching of language. University College London (UCL) is asking public to submit their suggestion of a new Chinese name. The winner will get a £1000 reward. The current Chinese name of UCL, 伦敦大学学院, the literal translation of Unversity College London, sometimes causes confusion in China where the concept of traditional English ‘college’ need some explanation. Also the current name is, as UCL admit, not very inspiring. As many other British universities, UCL have attracted many Chinese students. Having a classy and easy to remember Chinese name should improve the image and competitiveness of UCL in China. The requirment, submission form and contact details can be found here. A Thousand Years of Good Prayers, directed by Wayne Wang (The Joy Lucky Club, Chinese Box), won the Golden Shell For Best Film award in San Sebastian Film Festival. Henry O, the leading actor, also won the Best Actor Silver Shell award. The film is based on a story by Chinese author, Li Yiyun, whose debut novel, A Thousand of Years of Good Prayers, a compilation of short stories, had won her many international awards. The film tells the story of a retired scientist coming to visit his daughter in the States. He tries to comfort his daughter who is recently divorced but finds it’s difficult to communicate. Wayne Wang has directed two films from the same book. The other one, Princess of Nebraska, was also shown in the Festival. Charlie Lam won Best Cinematography award for Hong Kong director Pang Ho-cheung’s Exodus. British director Conrad Clark’s debut Soul Carriage, which was shot in China, won the New Director award.